AWARD WINNING QUALITY Beck Builders, Inc. was established in Hamilton, Montana by Paul Beck in 2005. With over 25 years of construction experience in the Bitterroot Valley, Paul has hand picked the finest craftsmen and women to build your “Dream Home”. Each of our team members are highly skilled in their respective trades and ready to deliver you their very best! INTEGRITY Our desire at Beck Builders, Inc, is to establish long lasting relationships, offer exceptional value, provide unbeatable service and create award winning quality for ALL of your construction needs. We are committed to your satisfaction. We believe in treating our clients the way that we would like to be treated. By partnering with you, our goal is to make the entire building process fun and exciting where you can call our work..."Home." UNBEATABLE SERVICES We listen carefully to your wants and needs to encourage excellent communication. We deliver detailed schedules and estimates. We assist you in making selections that meet your lifestyle. We provide highly qualified on-site supervision. We give attention to detail. We build every project with enthusiasm and excitement! We at J-Built specialize in residential building & remodeling with 27+ years experience in all phases of construction. We have our own wood shop to build specialty cabinets, built-ins & furniture. We make building your new home a great experience for you. Just imagine the fun, excitement, and anticipation of seeing your dream home take shape before your very eyes. And our specialty is providing "The Beautiful Building Experience". Our systems allow us to deal with potential problems before they become real problems. Our sterling reputation is a direct result of our great customer service, our communication, our attention to detail, and our projects consistently coming in on time and on budget. We put the fun back into building a new home. It can be done.... we do it consistently! Talk to our past clients or read their testimonials. They are happy to testify to this phenomenon. We are home builders with a heart. We have happy clients all over western Montana including Darby, Hamilton, Corvallis, Victor, Stevensville, Florence, Lolo, Missoula, Frenchtown, Arlee, and Seeley Lake. We provide the best design-build service of mountain style homes because of a strong, experienced and dedicated staff. This is our life and it is where we excel. Riversong Builders Inc. has been serving clients in the beautiful Bitterroot Valley in Western Montana for the past 17 years. 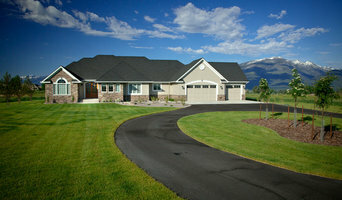 Riversong Builders has become known as one of the premier builders in Montana with their award winning homes. Our goal is to provide superior quality homes that capture the ideas and character of our clients, and make that a reality for them in their new home. We take pride in the fact that we build one home at a time. This allows us to be personally involved in the construction process, ensuring the use of quality materials & craftsmanship in your project. Top 3 Reasons To Build Using Our Panelized Packages Savings– Each day taken out of time on the build site reduces builders risk insurance, and total overhead costs. There are less cost overruns from trades and trip charges and reduced material waste which means you need less storage on site and have less to dispose of. Delays because of weather, material delivery, and subcontractor schedules-often unavoidable in traditional construction methods-are a lot less of a problem with panelized system construction. Almost everything is pre-cut to precise dimensions, making more accurate and quicker assemblies. You can build longer into the winter season. Quality & Precision-Using Revit, Auto-CAD & HSB our in-house design team can turn just about any idea into a working plan. The plans are then sent to our to the panelization shop, computer operated saws and K2 machine to manufacture the components and cut the wall package materials to exacting specifications. Each member of our manufacturing team has been trained to do a specific job and is an expert in that particular aspect of panelized construction which results in a building package that provides a much tighter building than is seen in traditional stick built construction. Many panelized home owners see an overall increase in energy efficiency in their homes. Environmentally Friendly-The key to our superior rustic accent homes lies in our materials, and their origins. We use only the best naturally seasoned, dry-standing Western timber as our exclusive source for log or timber material that is used for our interior components and some of our siding options. Dry-standing timber is cut fully seasoned, not green, and only one in 10 will make the grade.This standard means we’re one of only a select few companies in the country that manages the entire transformation from standing timber to the home itself. Homeowners can choose from over 45 models with hundreds of combinations of floor plans, and three different siding choices. Including Traditional True Half Log, Appalachian, Steel, and Craftsman style siding or we can do a completely custom home package for you. Bateman Building Company was founded in 2012 with the intention of bringing the highest craft and value possible to the work we provide our customers. Owner John Bateman’s decades of experience, beginning as a carpenter’s apprentice working on high-end projects in his hometown of Santa Fe, New Mexico, in the mid-1990s, are further enhanced by the talents and professionalism of a team of dedicated employees. From kitchen and bath remodels, to custom homes, to timber joinery or cabinetry employing reclaimed wood, our breadth of competency provides the advantages of keeping much of the work ‘in house’ while also allowing for a clearer view of the whole building process. More knowledge, in our experience, yields higher efficiency and better results. At Bateman Building Company, we like most to be involved in custom projects from the ground up. We recognize that our work is about trust and relationships as much as swinging hammers, and we strive to build and maintain relationships within the company, with our many longtime subcontractors, and with our clients. Our passion is to build projects we are proud of through an open, communicative process with passionate clients. Delve into the lifestyle of the American West. See inspiring photos of custom log and timber luxury cabins and homes. Handcrafted in Montana, renowned across America. Cornerstone Inc. is a full-service construction company and general contractor offering a number of building services. Our reputation has been built on providing quality custom construction and the unique replication of our client's vision. Having been in business since 2001, our goal is always the same: to feel a deep sense of pride in a quality construction project that has been built to our client's satisfaction. We seek to maintain the highest level of integrity, quality, service and stability within our Western Montana construction and custom home building company, and these things have always characterized Cornerstone. We are House Wrights specializing in residential and light commercial building and remodeling. Over 27 years experience in all phases of construction. We have our own wood shop to build specialty cabinets, built-ins and furniture. My name is Shaun Antonucci and I am a registered contractor for the State of Montana. I can build a home from the ground up. I have over 10 years of experience. In the early 1980s, the Pigman family joined together to form a small construction company. Over three decades later. Pigman Builders, Inc. has become one of the area's leading home builders. As the Bitterroot Valley has grown and prospered, so has our company. The year 2000 allowed us to remodel and add a second story to our facility. We have been blessed by the opportunity to work with a superb collection of clients, craftsmen and skilled employees. As a family business, grounded in tradition and Christian values, we will continue to focus on providing value and personal service to each of our clients. We are truly excited about the future which is full of opportunities to serve our clients and our community. What’s the most important step in building a new house from the ground up? Many people would say it’s choosing the right Victor home builder. Constructing a new house is a huge and multifaceted undertaking, so it’s important to find custom home builders in Victor, MT you can trust to bring your vision to life, as well as keep the process under control from start to finish. Although a construction job is never without surprises and challenges, a Victor, MT home builder who’s a good fit for your specific project will make these far easier to handle. For Victor residential home builders who also act as developers, the job starts well before the first nail is driven. They perform local market research to determine whether the prospective homesites make sense in the Victor, MT market, as well as survey the land on which the house will be built to make sure it is suitable for construction. Custom builders also obtain the necessary permits. 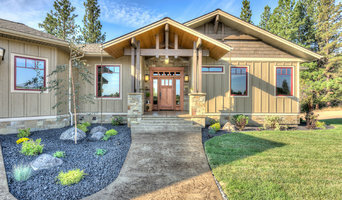 A good custom home builder in Victor, MT has skills that go far beyond construction — he or she must supervise subcontractors and artisans; keep tabs on local zoning regulations, building codes and other legalities; inspect work for problems along the way; and perform dozens of other roles that are essential in building a quality house. Here are some related professionals and vendors to complement the work of home builders: Interior Designers & Decorators, Landscape Architects & Landscape Designers, Architects & Building Designers, Kitchen & Bath Designers, Specialty Contractors. House builders are responsible for ensuring that the home-building project sticks as closely as possible to the specified timetable, particularly in the event of change orders. Custom and luxury home builders in Victor, MT also need interpersonal skills to deal with clients of all types, soothe frazzled nerves, negotiate conflicts and resolve problems. Find custom home builders in Victor, MT on Houzz. Narrow your search in the Professionals section of the website to Victor, MT home builders. You can also look through Victor, MT photos to find a house you like, then contact the builder who worked on it.